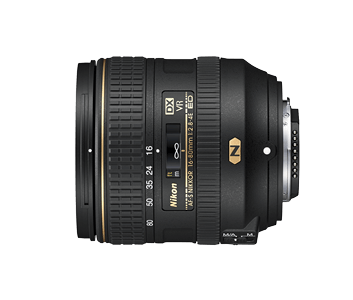 Ascend to a new level of photography with the AF-S DX NIKKOR 16-80mm f/2.8-4E ED VR, the world’s lightest*1 DX-format 16-80mm*2 f/2.8-4, 5x normal zoom lens that delivers impressive optical performance. A first for DX-format lenses, the AF-S DX NIKKOR 16-80mm f/2.8-4E ED VR incorporates Nano Crystal Coat technology that reduces flares and ghosting, an electromagnetic aperture mechanism that allows for stable exposure control, and a fluorine coat that effectively repels dust, water, grease and dirt. With the inclusion of a 4-stop Vibration Reduction (VR) system*3, allowing for sharper images and videos in a wide range of conditions, the AF-S DX NIKKOR 16-80mm f/2.8-4E ED VR is an excellent high-performance lens for everyday use and an integral component to your photography arsenal. 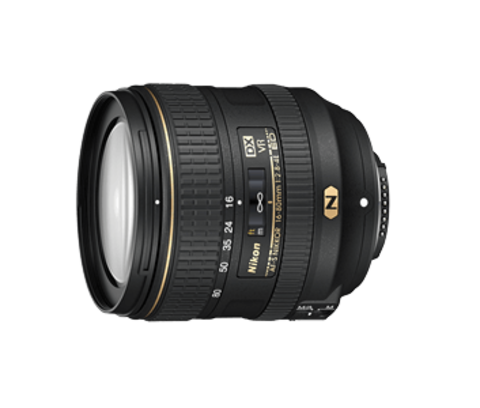 The AF-S DX NIKKOR 16-80mm f/2.8-4E ED VR is a high performance 5x normal zoom lens featuring f/2.8 aperture at the maximum wide-angle position, resulting in a fast zoom lens ideal for capturing a vast range of shooting situations. In addition, a Nano Crystal Coat, aspherical lens and ED glass elements come together to achieve high optical performance. The Nano Crystal Coat, a first for DX-format lenses, is an adaptation of a coating featuring nano-sized crystal particles that effectively reduces flares and ghosting, so you capture sharper imagery with every shot. 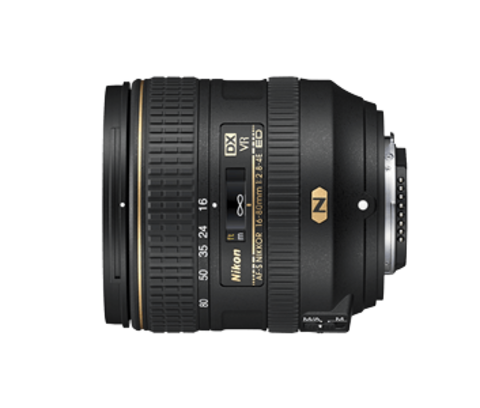 At approximately 480g, the AF-S DX NIKKOR 16-80mm f/2.8-4E ED VR is the world’s lightest*1, DX-format compatible, 16-80mm*2 lens and is an ideal everyday companion that gives you the freedom of greater manoeuvrability to capture your creative vision. In a first for DX-format lenses, this lightweight and durable lens has a fluorine coat applied on the outer surfaces of the extreme front and rear lens elements. A unique NIKKOR lens technology, this fluorine coat effectively repels dust, water droplets, grease or dirt for easy removal, giving you the freedom to conquer the elements with total peace of mind. A Vibration Reduction (VR) system is incorporated to provide an effect equivalent to a shutter speed 4.0 stops faster in NORMAL mode*3, enabling you to shoot sharper and crisper handheld shots. In another first for DX-format lenses, the AF-S DX NIKKOR 16-80mm f/2.8-4E ED VR incorporates an electromagnetic aperture mechanism, which is an aperture blade unit with drive mechanism that is controlled via electric signals from the camera body. This mechanism allows for stable and reliable auto-exposure control even during high-speed continuous shooting, wherever you go. *1 Among 5× normal zoom autofocus (AF) lenses with a maximum aperture of f/2.8 at the maximum wide-angle position for digital SLR cameras equipped with image sensors equivalent to the APS-C size available as of July 2, 2015. Statement based on Nikon research. *3 Measured in accordance with CIPA standards using a DX-format digital SLR camera. Measured at the maximum telephoto position.